Choose from Ethiopian, Kenya, Tanzania, Bolivia, Honduras, Nicaraguan coffee. Developed in a Danish coffee academy - and based on several patented inventions - the Grower's Cup coffee kit aims to deliver 'gourmet' coffee to rival that produced via the traditional coffee plunger/French press. 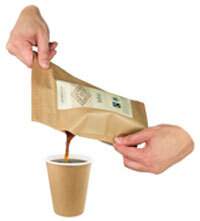 The 'CoffeeBrewer' is basically a sealed paper/light cardboard sack containing the coffee. The sack is designed such that it can stand on its own, has a small area that can be used as a handle plus an exit for the coffee once brewed. It is very simple to use. You open the top, pull out a small red tag, stand the pack up on its base, add about 0.5 litre of hot water, leave for 6-8 mins then pour. I found that it was pretty well cool enough to drink immediately (ambient temp about 20 deg C) so I'm guessing that you probably wouldn't want to leave it very long in cold weather. So it's quick and easy to use (although obviously you need a flask of hot water with you - or means of procuring same!). The downside is that it's a little bulky and you need to carry the used pack until you find somewhere to dispose if it. The used pack (with dried out coffee grounds) weighed about 80gms. Not the cheapest way of having a cup of coffee on the the hill and it is a little bulky ... but if you want a bit of indulgence on your walks, backpacking or camping trips, then the Grower's Cup kit does produce some extremely good tasting coffee.